Coffee With Games: Donkey Kong Country Returns! How much have U.S. Wii owners reported playing? 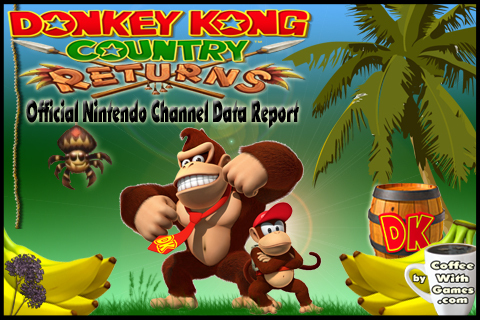 Official U.S. Nintendo Channel data report. 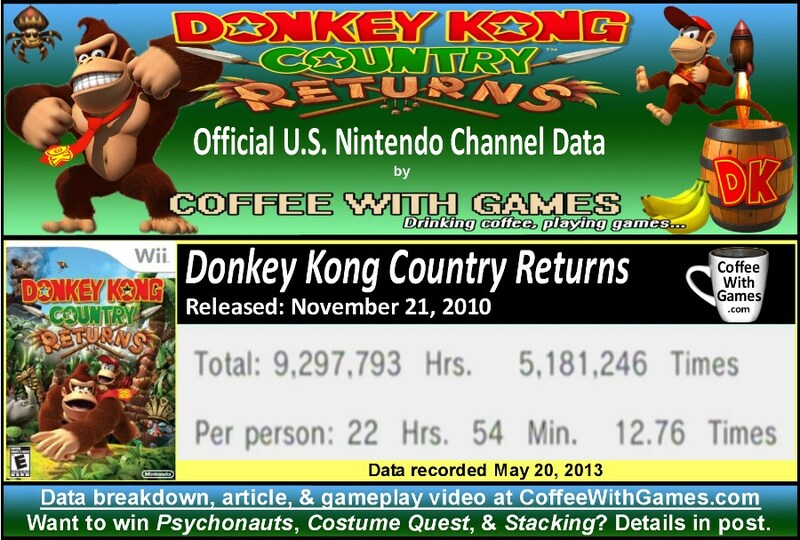 Donkey Kong Country Returns now has approximately 406,053 U.S. Wii owners with nearly 10 million Total Hours of game-play data reported, with about 911 days reported. This is an increase of almost 400,000 more U.S. Wii owners that have had game-play data for the game reported, than when it first debuted in December 2010. The game's average reported play time of 22 Hours 54 Minutes "Per person", seen in the image below, averages out to be about 1 Hours 47 Minutes played per time reported. For comparison to other Nintendo Wii platforming games, Donkey Kong's reported hours "Per person" are lower than New Super Mario Bros. Wii's, but slightly higher than Kirby's Epic Yarn's. What about critic and customer reviews for the game? The last time we looked at the reported data, DKCR had a "professional" critic review score average of 87.79%, based on 53 reviews on GameRankings. Now, the game has a critic review score average of 87.87%, based on 55 reviews on GameRankings.com. Its customer review score average was 89.86%, based on 306 reviews from Amazon.com. Donkey Kong Country Returns now has a customer review score average of 89.69%, now based on 427 reviews on Amazon.com. It's been a while since I last played Donkey Kong's platforming Wii adventure, but as I have stated before, I really did enjoy my time with the game. I have done several Nintendo Channel data reports on the game over the last few years, and you can take a look at the different times reported for the game over the years: HERE, HERE, HERE, HERE, and HERE. I believe that Monster Games (probably best known for Excite Truck, ExciteBots, and PilotWings Resort to Nintendo fans) is the company Nintendo hired to port Donkey Kong Country Returns from the Wii to the 3DS. While I'm really glad to see Monster Games continuing to work with Nintendo, I do hope that they have been working on another, newer, game for either the Wii U or 3DS. 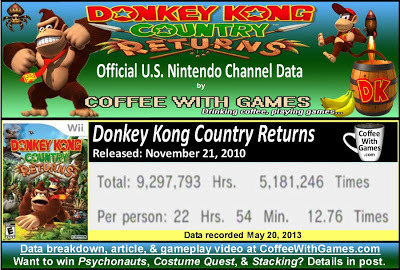 I think it would be interesting to see what Donkey Kong Country Returns 3D's average hours "Per person" end up being, and specifically what the average hours reported per time would be. Unfortunately though the 3DS, like the Wii U, doesn't have a Nintendo Channel where all the game-play data is reported. I think it would be interesting because of the portability of the game on the 3DS now, if it would end up having a higher or lower average overall. Do you want a chance to win Psychonauts, Costume Quest, and Stacking? Simply make sure you're following me on Twitter, HERE, and tweet out this post using the Twitter button beneath this post (it's in the image below if you're not sure). Include the hashtag #DonkeyKongCoffee in it, and tweet it to @NintendoAmerica. The winner has been announced, HERE. Have any of you played through Donkey Kong Country Returns on the Wii in the last year, and if so, what did you think about the game? If you own a Nintendo 3DS, have you already purchased Donkey Kong Country Returns 3D for the system, and if you have had a chance to play it, what do you think about it? If you have played both the Wii and 3DS versions, do you prefer one more than the other; assuming you have had the chance to play the 3DS version a decent amount already? You can see Donkey Kong related games and items below! I'm about to start playing the 3DS game, having never played the Wii original. I don't know why I missed that game, I loved the SNES trilogy with a passion. "...I loved the SNES trilogy with a passion." I was a huge fan of the original on the SNES, and even convinced my parents to let me open it early, as it was originally going to be a Christmas gift. As for the hours, there was a comment on the first report from a person that had concentrated on just main levels without the extra levels, and it took around 10. But, they were planning on going back for more, and were just having a lot of fun with the levels. Then there are some like Mrs. Coffee and I who are about 3 times above the "average" reported, so I think it's interesting seeing these land over time. Especially compared to a game like Kirby's Epic Yarn, which released the same year, but the month before DKCR. 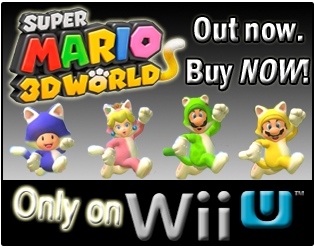 I don't have the 3DS version and don't intend to buy it unless I get an awesome deal. I think it's interesting that they made the game easier, which was really a turn off for many people. As much as people complain about super-guide or whatever, really challenging games frustrate them too. I liked how many games used to have an easy mode but you could only finish up until level 3 or whatever. No one solution is perfect for everyone, but a happy medium can certainly be found. Kirby's Epic Yarn took it too far IMO. I was also a little disappointed Monster wasn't given something new to work on, but hopefully now that they have 3DS experience their next title will be released on Wiiu/3ds. Rumors and speculation is that Nintendo wants to revive several dormant franchises and Monster has proven they can do more than racing titles, so I'm eager to see which if any they might get handed. I spent quite a bit of time on DCKR, but never finished it, a lot of my game time was finding/actually getting the collectibles, so I replayed a lot of levels instead of pushing ahead. As I recall I played Wii remote only, so maybe I'll try it out with the nunchuk next time. Don't pass up Donkey Kong Jungle Beat, a nice little GC title re-released under the new play control series. I have a review copy for the 3DS and I'm really enjoying it. Starting to get a bit tough though :). Never played the Wii version, so I can't compare. All I know is, I like the 3DS version! I never played any Donkey or Diddy Kong games except Donkey Kong 1 and 2 but I've heard those games and other games in the 90's were also good..which was the best in the 90's that I should check out? Donkey Kong Country 1 and 2 are the best of the three Super Nintendo Donkey Kong Country games. Those are highly recommended. The third game just didn't seem up to par with the first two, but it's still worth a look. Donkey Kong 64 is also worth a look, even though it's not my personal cup of tea. Trust me man, I played the Wii version and spent right around those hours on it, and still haven't done everything possible. I have 101%, but you can get 202% by beating the game again in mirror mode, with fewer hit points to boot. Not to mention, you can try to get a medal for each level, with all shiny gold medals being the goal. Even if the 3DS version is somewhat easier, if you want to get 202% and all shiny gold medals, you're in for a much longer ride than 22 hours and 54 min lol... and it's worth every second trying to do. As I said, just 101% took me around 15-20 hours with a friend. Is this one you think your son might be interested in for the 3DS? The reason I wonder, is because I thought you mentioned at one point him really enjoying Mutant Mudds on it, and this is definitely challenging fun along those lines (or, the Wii version was). Speaking of Luigi's Mansion though, Bean 1 keeps wanting to go back to GameStop, and play the in-store demo of it...and it's been over a month since we visited! I'll be watching for your review! Hopefully, it's not like another Nintendo published title...from a few years back and I'll see the review up in 2015? I really enjoyed the first Donkey Kong Country, and it was probably my favorite. It's been a long while since I played any of the SNES games though, but hopefully Nintendo gets these out for the Wii U's Virtual Console service quickly, and I can pick them up since I skipped over them on the Wii. Thanks for stopping by and the comment and feedback! I never did try out Donkey Kong 64, even though I did own the Expansion Pack. We still enjoy running around in Super Mario 64 on the Wii's Virtual Console service. Was Donkey Kong 64 set up the same way, with an open free roaming aspect between choosing levels to play in? Thanks for stopping by as well, and for leaving the comment and feedback to another user! I think he would be. He likes platformers and such more than I do. For example he probably logged 3 or 4 times what I did into Super Meat Boy when I picked it up. Sounds like Luigi made quick the impression on your Bean. Considering the GameCube Luigi's Mansion is still one of my favorite games for that console, I have little doubt that the 3DS follow-up will interest me as well. Ouch! Yeah...the truth hurts :). I'm actually going to publish my review of DKCR3D next week. I wanted to do it today or tomorrow, but I have too much going on between work and school, I just don't have the time. 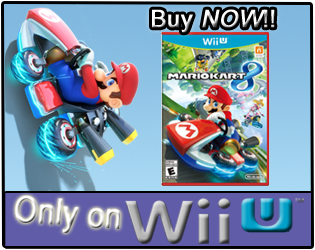 You can play it in two game modes, New Mode which is easier or Original which is the same as Wii. Learn the facts.